When you run command then Insert Area Boundary dialog box will pop up. A. Find nested boundaries Check box: If this check box is selected then it will detect internal Area of closed entity in our case Rectangle. By default it will show ‘As Displayed‘ option which means command will consider boundary set of visible are in Drawing. If we select ‘Specify entities’ tab next to it and click select closed entities then this section will show number of entities specified and those will be converted into area boundary. 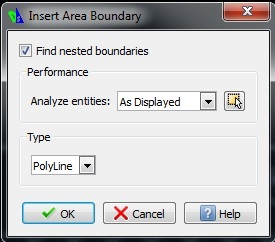 Area boundary types can be of Region and Poly line. Based on your selection Boundary entities will convert into Region or Poly line. If you want to convert any region entity to Poly line then First of all Explode that region entity. Run command: EDITPOLYLINE or Go to Modify > Entity > Poly line. Select option Multiple if exploded region creates multiple entities. Select all Entities with Window Selection and Press Enter. Confirm: Convert Lines and Arcs to polylines? This will give you additional options > Select option Join .